by Julia M. Puaschunder, alumna of the IIASA Young Scientist Summer Program 2016. The world is on the move. Currently, more than 250 million people live outside their countries of birth. Of the moving masses, an estimated 6% are refugees fleeing across borders to more favorable environments. The ongoing European refugee crisis has increased the pressure to reap the benefits from migration while alleviating the burdens of societal movement. Estimates of directional flows between 123 countries between 2005-2010. Only flows containing at least 50,000 migrants are shown. 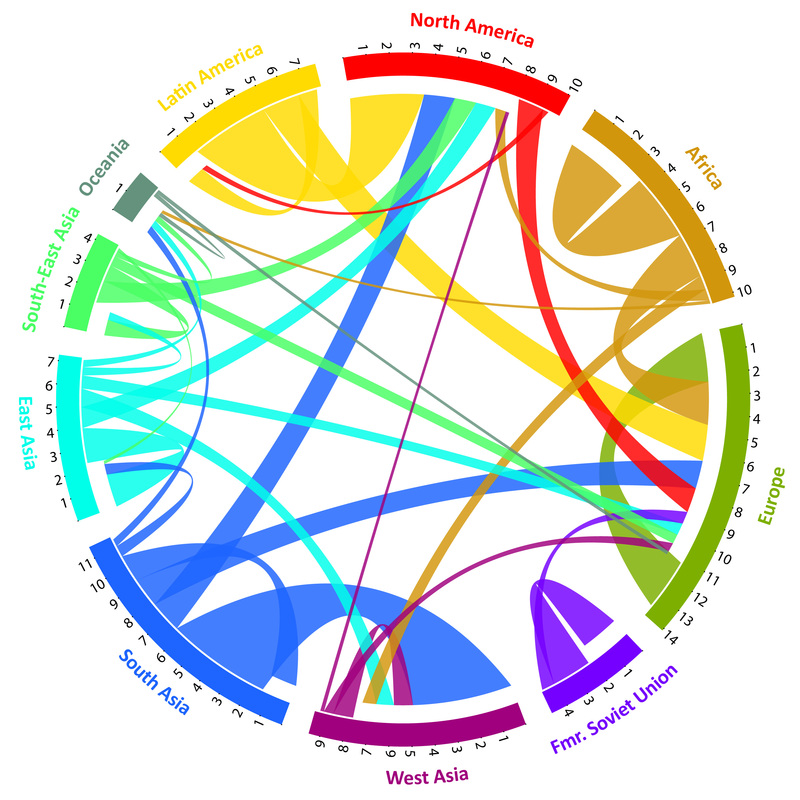 “The Global Flow of People” (www.global-migration.info) is by Nikola Sander, Guy Abel & Ramon Bauer, and published in Science as “Quantifying global international migration flows” in 2014 (vol. 343: 1520-152). Concerns were recently raised as to whether granting asylum to refugees—who often make up the most productive parts of their original populations—prevents (re)development in their fractionated home countries? An important consideration absent in these debates are the monetary gifts migrants send to their family members back home. The World Bank estimates that migrants currently return around 450 billion US Dollars per year to the developing countries they came from, and this number is expected to rise. These monetary remittances have multiple positive impacts, including economic growth. As refugees are primarily younger to middle-aged, their remittances likely pay for their wives and children’s access to medical care and education, or support their parents when pension systems are missing. Intergenerational monetary transfers are therefore the focus of my recent publication Gifts Without Borders. Contrary to conventional institutionalized sustainable development, remittances grounded in intergenerational care benefit from communication within families. Long-lasting family ties allow direct feedback. People truly care about their loved ones back home and families share their day-to-day experiences honestly. Intergenerational remittances beyond borders are thus a purer and potentially longer-enduring pathway to sustainable development, as these stable funding streams’ impact is more accountable than standard international aid. Based on World Bank and OECD data covering almost all countries of the world, my forthcoming publication in the book ‘Intergenerational Responsibility in the 21st Century’ highlights that the intergenerational glue of a migrating population helps countries lacking socially responsible and future-oriented public sectors. Rather than blaming asylum-granting countries for removing the labor force from fragile territories, hosting refugees is portrayed as making use of human capital in stable economies, while refugees—at the same time—develop their former homelands by direct monetary contributions in a natural, transparent, and accountable way. In the age of migration, analyzing intergenerational networks and their financial flows is an important, but unexplored, facet of sustainable development. My findings open prospective research avenues on how we can align the economic outcomes of human capital mobility with sustainable development. The IIASA Young Scientists Summer Program granted a vibrant setting to discuss my findings in a group of international, diverse, and multi-disciplinary future academic leaders during this summer, which was filled with beautiful moments in the historic Schloss Laxenburg in Austria. Recently IIASA also launched a Joint Research Centre of Expertise with the European Commission on Population and Migration, which aims to predict how migration will impact future economies and societies. In addition, the Advanced Systems Analysis (ASA) Program hosts the ‘Economic migration, capital flows, and welfare’ collaboration between ASA and the World Population Program to model dynamics of economic migration and investment. This research is also directly related to my New School Economic Review paper ‘Putty Capital and Clay Labor: Differing European Union Capital and Labor Freedom Speeds in Times of European Migration,’ which elucidates trade differences in capital and labor flows gravitating the benefits and burdens of globalization unequally and the potential problems arising for the European project from migration. 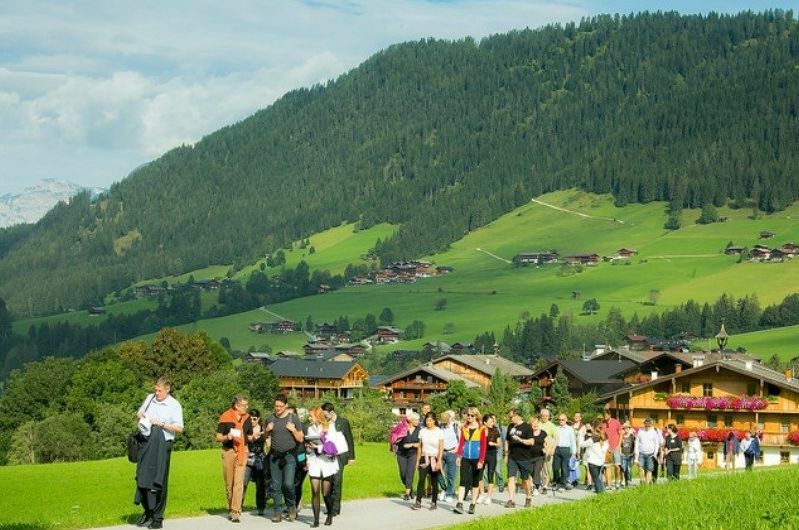 Above all, attending the IIASA 2016 Alpbach-Laxenburg Group Retreat at the European Forum Alpbach helped to enhance my understanding of the relationship between migration and intergenerational responsibility. All these endeavors are targeted at contributing to sustainable development in a world on the move.